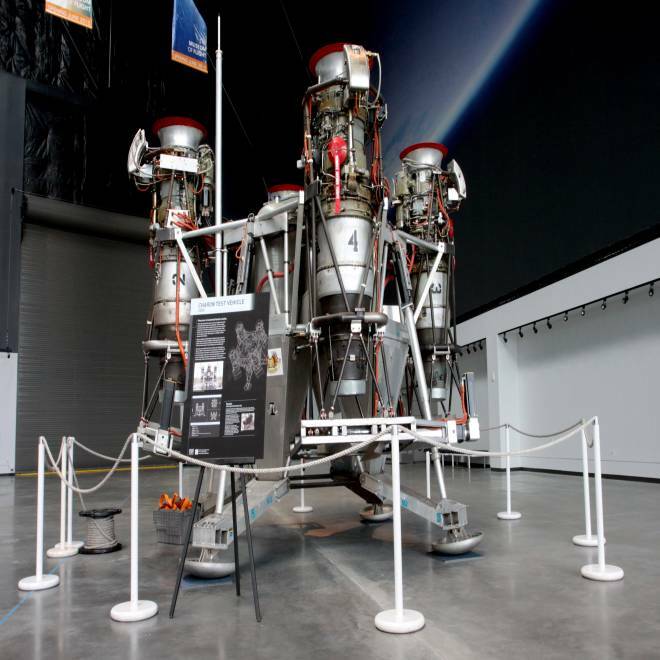 Blue Origin's jet-powered Charon test vehicle is brought inside Seattle's Museum of Flight. Blue Origin, the rocket venture backed by Amazon.com billionaire founder Jeff Bezos, is sharing a 9,500-pound hunk of its little-known history — in the form of its first flying vehicle, a jet-powered lander prototype known as Charon. The behemoth went on display this week in the Charles Simonyi Space Gallery at Seattle's Museum of Flight, which will also house a full-scale space shuttle training mockup. Before this week, few folks outside Bezos' venture ever heard of Charon. 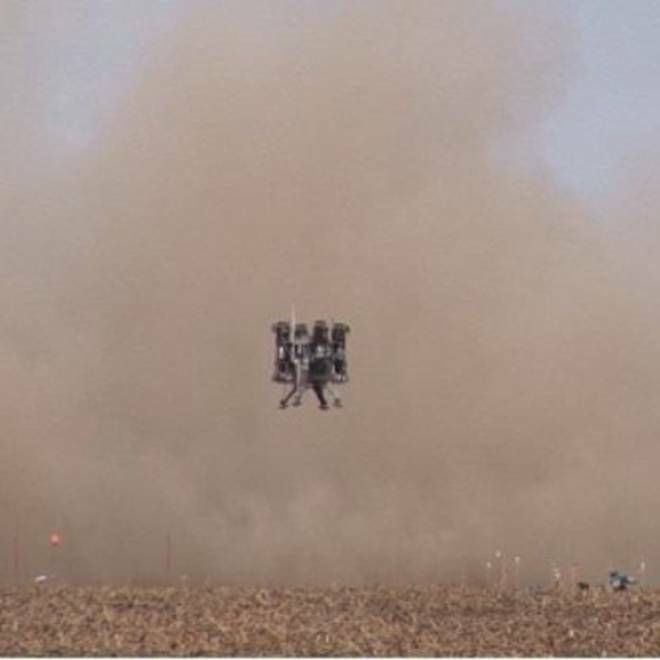 The takeoff-and-landing platform was powered by four vertically mounted jet engines — and flew only once, on March 5, 2005, in Moses Lake, Wash. It rose to a height of 316 feet, then settled back down to a controlled landing. 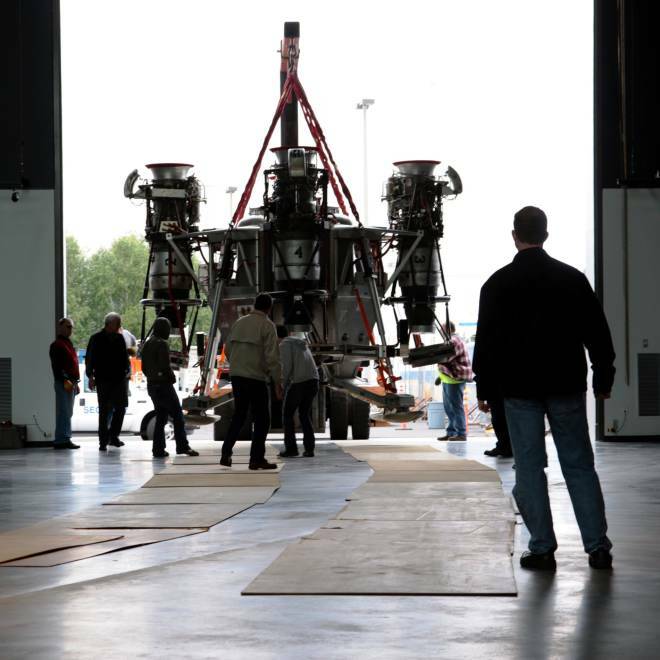 Charon was moved into the museum on Tuesday and unveiled to the public on Wednesday. "We are proud to share this piece of our company history with the Museum of Flight," Rob Meyerson, president and program manager of Blue Origin, said in a statement released by the company. "By making the original Charon vehicle available for public viewing, we hope to educate and inspire the next generation of aerospace explorers." The technologies pioneered by Charon were applied to Blue Origin's vertical-takeoff-and-landing rocket ships — including the Goddard prototype that flew for the first time in November 2006 at Bezos' Texas spaceport, and the more capable test craft that followed. Last year, Blue Origin sent its prototype craft for suborbital space missions up to an altitude of 45,000 feet at supersonic speed — but Bezos reported that the flight had to be terminated with the loss of the vehicle, due to a flight instability that cropped up during the test. The jet-powered Charon lander prototype rises during a test flight in 2005. Blue Origin's Charon lander prototype is settled in its spot inside the museum. Blue Origin is working on a new prototype for its suborbital space program, which aims to carry passengers and research payloads beyond the 100-kilometer (62-mile) boundary of outer space. At the same time, it's receiving millions of dollars from NASA to help with the development of an orbital space vehicle that could service the International Space Station. Historically, Bezos and Blue Origin have played their cards close to the vest — but in recent months, the venture has been more open about its ambitions and its progress. That's in line with the model being set by another space-minded billionaire, Elon Musk, the founder of California-based SpaceX. Seattle's Museum of Flight stands to benefit because Blue Origin and Amazon.com are both headquartered in the Seattle area. "Blue Origin is making incredible strides in bringing commercial space travel to fruition," Douglas King, the museum's president and CEO, said in the statement. "Charon is an exciting addition to our extensive collection of historically significant air- and spacecraft. The fact that it comes from a company in our hometown makes it even more prestigious." King is angling to acquire artifacts from other space ventures, ranging from SpaceX to the Boeing Co. Seattle-area software billionaire Charles Simonyi has already donated a used Russian Soyuz spacecraft for display. The piece de resistance will be the shuttle mockup, known more formally as the Full Fuselage Trainer, which is currently in the midst of being transported to the museum from NASA's Johnson Space Center. The trainer is expected to be assembled in its new home by the end of the summer. Correction for noon ET May 25: I originally wrote that Charon was pronounced "CARE-on," like the name of the mythical Greek ferryman of the underworld. Actually, Blue Origin's Charon was named after Pluto's largest moon. That suggests that the name should be pronounced "SHAR-on," for reasons I explain on page 56 of "The Case for Pluto." Alan Boyle is msnbc.com's science editor. Connect with the Cosmic Log community by "liking" the log's Facebook page, following @b0yle on Twitter and adding the Cosmic Log page to your Google+ presence. You can also check out "The Case for Pluto," my book about the controversial dwarf planet and the search for new worlds.